Learn the Japanese form of braid-making with Georgette Sahm. 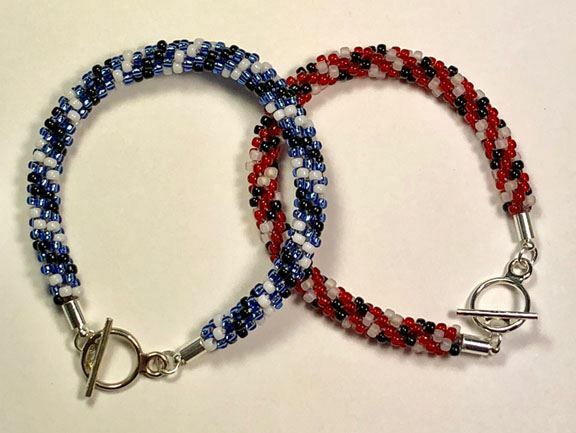 Learn basic beaded kumihimo techniques as you make a bracelet using 8/0 seed beads. The class will cover the fundamentals of kumihimo, including; Cord length requirements, threading beads, kumihimo braiding, and finishing techniques. All level of beaders are welcome. Kits are available and are recommended. Georgette Sahm was a Home Economics teacher for 16 years and has taught various textile class for all levels including adults. She has taught many beading techniques such as, bead crochet, herringbone, peyote, kumihimo and beaded chainmaille. 1 - Kumihimo Disk 6"
NOTE: There will be enough beads and cord to complete multiple bracelets.